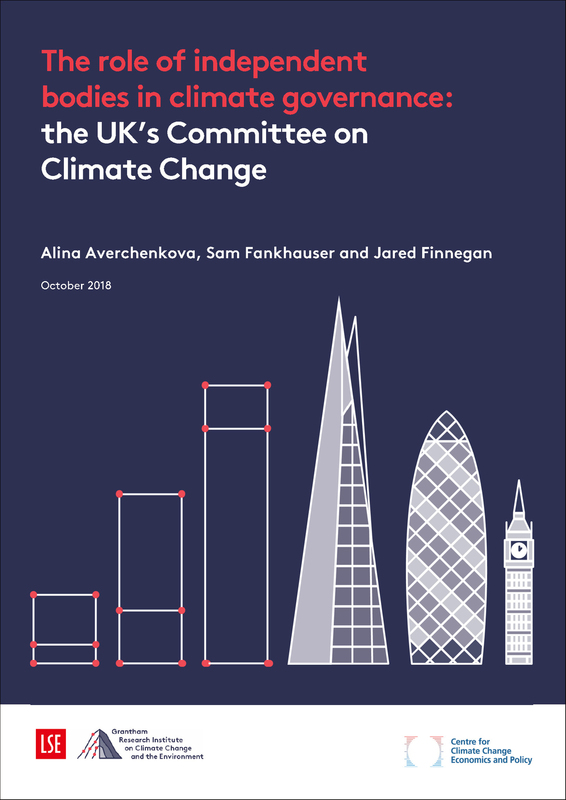 This report assesses the role of the independent Committee on Climate Change (CCC) in shaping UK climate policy, drawing out lessons for international and domestic policymakers. Established 10 years ago under the 2008 Climate Change Act, the CCC is a central pillar of climate governance in the UK; its reputation and apparent success in helping to deliver the UK’s climate change objectives make it worth studying. The report offers an introduction to the CCC’s main organisational features, its budget and its analytical capabilities; an assessment of its impact on the climate change debate in Parliament – including a case study of the debates on the first five carbon budgets; and analysis of its impact on other relevant policy debates – with case studies of the 2016 Energy Act and the debate on flooding. An 8-page summary policy brief is also available. An independent expert body can strengthen climate governance by introducing a long-term perspective, enhancing the credibility of climate targets and ensuring more evidence-based policymaking. To be effective, independent advisory bodies must have an appropriate status. This means having a clear statutory mandate, strong leadership, adequate resources, and sufficient powers to hold Government to account. Independent bodies can support policy delivery on both emissions reduction (mitigation) and climate resilience (adaptation). There is sufficient thematic overlap to entrust independent scrutiny on both of these areas to the same body. As the number of independent climate change committees grows around the world, there is merit in deepening and formalising international coordination between these bodies. This could build on an existing informal network among European committees. 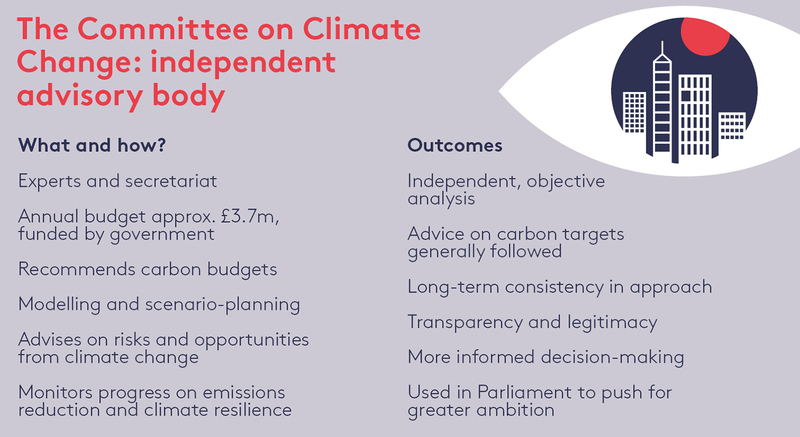 A strong, independent CCC is essential to meeting Britain’s climate change objectives. The CCC’s analysis is used and trusted by stakeholders on all sides of the debate. 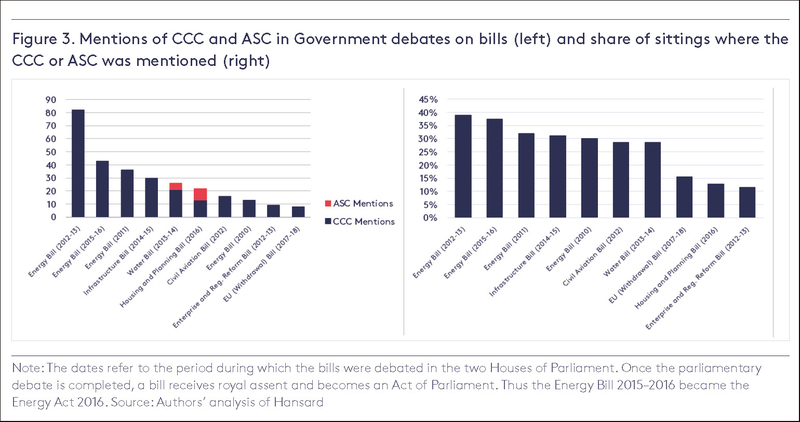 In Parliament, CCC analysis is used particularly often by Opposition politicians and to make the case for greater ambition. 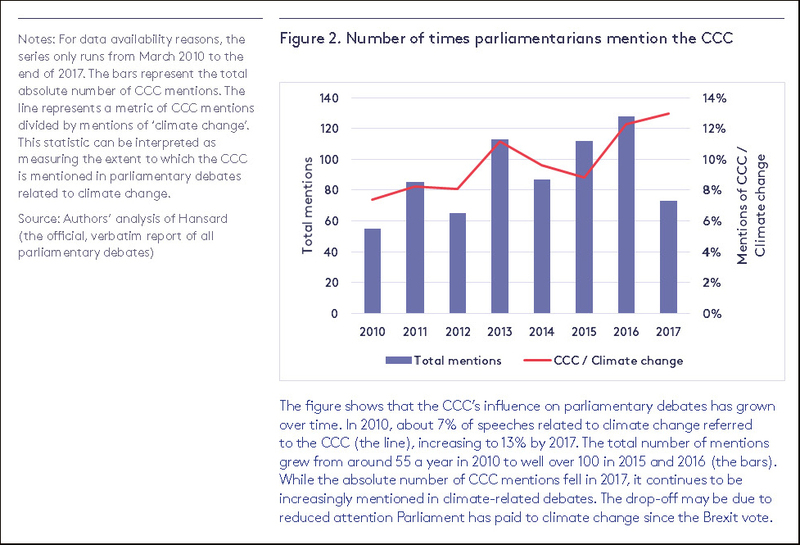 The CCC has made a material difference to the way climate policy is conducted in terms of objectives (the statutory carbon targets), process (impact on parliamentary debate) and substance (e.g. influencing new laws on energy, infrastructure, housing and water). The basis of the CCC’s success is a careful combination of rigorous analysis and extensive stakeholder engagement, including with Parliament. However, recent budget cuts and delays in the ministerial approval of new members could put at risk the CCC’s ability to deliver its ambitious work programme over the coming years. The Government runs the risk of a judicial review if it does not follow the policy advice of the CCC more carefully. Important policy recommendations have been overlooked, and a gap has opened between climate targets and the policies to deliver them. How influential is the UK’s Committee on Climate Change?